We're on to phase three of the major dredge at Haslar Marina. This year we're tackling the C-D channel, and all berths will be dredged to 2.5-3m below chart datum. The marina will be operating as normal during the dredging, but please proceed with care as pontoons will be moved and the barges will be moving around the site. Visitors are welcome and should call ahead to confirm berth allocations. Sealift2 will be providing lift, scrub and antifoul services as usual. Our team will contact all C and D pontoon berth holders to arrange a temporary berth, either within the marina or at one of our other sites. Once boats are off their berths, we will be unbolting and moving all the finger pontoons out of the way so to allow the dredger and barges down to the shore side of the channel, and then they will work outwards from there. As each section is dredged we will be reinstating finger pontoons and putting boats back onto their berths. The dredging equipment will consist of a back-hoe on a barge to dig mud from the seabed, and two hopper vessels to take the mud out to the Nab Tower dump ground. The contractor doing the dredging works, Jenkins Marine, have planned for long days to complete the work as quickly as possible. They will work Monday to Friday 6am to 9pm, but may need to work weekends if the weather puts them behind schedule. 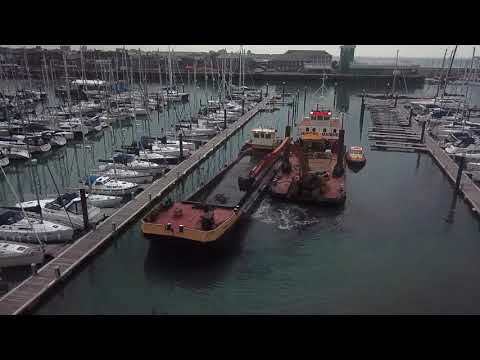 If you'd like to see what dredging operations look like, the video below was taken by one of our berth holders during last year's dredge.